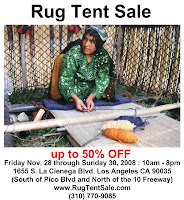 We will be having a huge Rug Tent Sale from Friday Nov. 28 (The Black Friday) through Sunday Nov. 30, 2008. During the past few days, we have been busy getting prepared for this event. Almost all of our rugs will be on 30% off sale and select items will have 50% off and these are the more expensive items to encourage the customers to buy them to provide us with more cash. This is going to be a very exciting rug sale in Los Angeles with live rug weaving workshop and live rug repair show to educate our customers. We have printed postcards, and mailed hundreds of them. Many of these postcards will be hand delivered this afternoon in our neighborhood. We have sent thousands of e-mails and I have promoted this event in several meetings that I have lately attended. Tomorrow Thursday is the Thanksgiving day here in the United States. Our rug store will be open from 9:00 am to 1:00 pm and we will take care of the last minutes jobs and preparation. Pedro, the guy who takes care of our tent will be on our parking lot at 7:30 am to install the big tent. Later in the day on Thursday, we will attend a Thanksgiving party in a friend’s home to meet with several friends who will attend this beautiful event from San Diego and Orange County. We celebrate all the good events if we can no matter where they come from and which one belongs to whom. Life is too short and we cannot afford not to celebrate. Don’t you agree? I hope all of Los Angeles knows of, and will go to, your Tent Sale! Thank you for your kind words. I also wish you a happy and wonderful Thanksgiving. I liked the post on your blog on “Shouldn’t a Certificate of Authenticity come From and Independent Source?” I totally agree with you on this.